Innovative uses of technology are fantastic but at its core, the daily business of using technology to support learning has to be based around sound thinking and critical pedagogy. Are the foundations there to build transformational learning opportunities? Do the staff (and students) have the skills in order for them to move forward? Like any decision about what takes place in the classroom, careful planning of lessons is crucial. Recent posts by @TeacherToolkit and @learningspy have talked about 5 and 2 minute lesson plans respectively but the timing of the planning belies the thinking that goes on beneath the surface; the years of teaching experience that goes in to making it possible to be able to create a lesson plan in this time. The framework they’ve given helps with this; breaking the thinking down so that learning episodes and thinking can be represented on the plan. All that said, there’s no room there for planning technology use – this also needs careful planning and decent consideration. Best thinking about how technology can be used in the classroom in and of itself can bring about higher order aspects of transforming learning. This isn’t to go against the mantra of technology ‘enhancing the learning, not dictating the learning’, but given that technology use in lessons can help to bring about learning which is more transformational, it would be remiss not to give it due consideration. Choosing not to use technology in a lesson is fine and certainly, analogue activities can on many occasions be far more valid than those completed digitally. The work of AJ Quidgely on using multiple whiteboards in his classroom or Tom Sherrington’s idea of using mini whiteboards in lessons to support learning and AfL are great ways of using analogue methods. When thinking about how you can or whether you should even use technology in lessons to support learning, following the superb framework by Dr Ruben Puentedura of SAMR always seems to be a terrific way of ensuring activities are more purposeful. 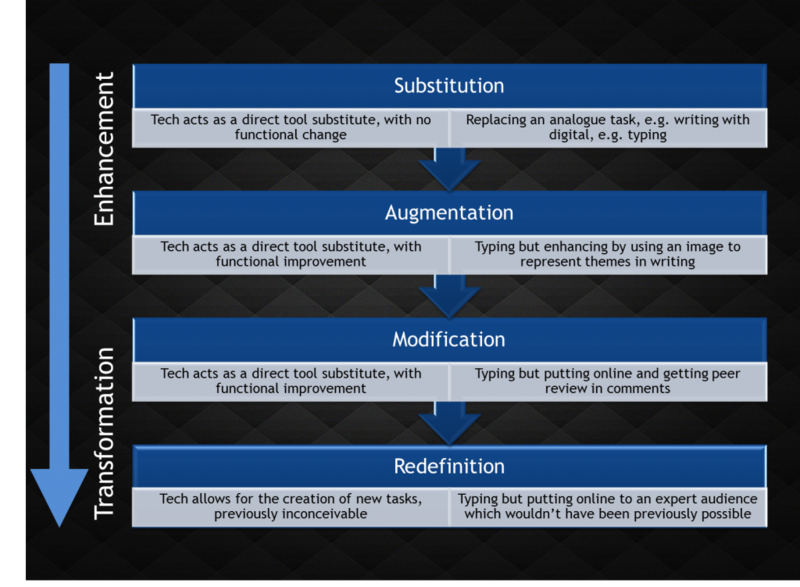 This is his Substitution, Augmentation, Modification, Redefinition model. This framework and more about it is highlighted in this post here: https://ictevangelist.com/?p=979 and in my recent TeachMeet presentation here: http://www.rvl.io/ictevangelist/transforming-learning-using-technology which can also be viewed from a live recording here: http://www.youtube.com/watch?v=Md2AmD1g_ys and my beginner’s guide to SAMR here: http://www.youtube.com/watch?v=ZxNe04JYR-g. The framework breaks the various activities down in to two sections – enhancement (that’s the substitution and augmentation levels) and transformational (that’s the modification and redefinition levels). The process of giving detailed thought about the way in which technology is used to support learning is one which is really going to help to give activities more meaning. Thus, the learning potential gained is more meaningful too. So what has all this got to do with iPads? I mean, I haven’t actually mentioned them in this post at all yet, other than in the title. Well, it’s thinking about the learning which is the most important aspect of technology use. If anyone asks me about the iPad project I’m involved in I’m always keen to stress that it’s as project about learning, not technology. Ok, yes, there’s technology involved, but with iPads, the opportunities and possibilities for significant transformational gains are far more considerable than with other models (currently).Take BYOD for example. Yes, having extra equipment available to research from, to take notes on, to take photos on, so forth and so on, is improved, but with a diluted ecosystem, (with multiple devices in place) the opportunities for planning learning with pedagogy at the heart of it are diluted further. You simply don’t have the same kind of opportunities you have when you’re working with single devices all capable of running the same applications to support learning. Don’t get me wrong – getting technology in to schools is a great way of supporting and enhancing learning, but if the NESTA report ‘Decoding Learning‘ can teach us anything, it’s that in many schools across the world, technology is being highly underutilised. Interactive whiteboards, iPads, Galaxy tablets, Surface etc – the money spent on all of it will be highly wasted if people aren’t engaging in their use, thinking about how the technology can be best used and sharing in a culture of driving modern learning forward in ways that students want to learn in, appreciate more and brings about a redefined way of learning. Why bother using technology at all if you’re not going to get the best learning out of it? I recently read a blogpost by Greg Swanson (@GregDSwanson) on iPad apps linked to the different levels of SAMR here: http://appsineducation.blogspot.co.uk/2012/11/samr-model-apps-poster.html – what he had done was to create a poster with different iPad apps linked to the various SAMR levels. Now fair play to the guy, to a large extent I would agree with many of his choices at the different levels. We could certainly argue too that some of them could help to hit improved levels of transformation if used in the right way. Conversely we could argue those matched to the redefinition level could come down if used in different ways too. That’s the thing though – because we have both spent time and energy familiarising ourselves with these applications; trained ourselves in the pedagogical benefits and the means in which they can be used; discussed them with like mind Twitter folk to squeeze out the best possible uses… we are better placed to take those kinds of distinctions, thoughts and put them in to great practice. What concerns me greatly is what I hear every day on my Twitter feed and the sorts of evidence I read in the NESTA report. Schools have been buying tech again without giving it the thought and the training of teachers required to ensuring that it is a LEARNING project and not a technology project. So when a teacher stumbles upon Greg’s site and sees that poster, they would be quite right in thinking “DING!” if I use “Book Creator” (which he has placed at the redefinition level) then I’m automatically transforming learning in my classroom. Well, no… not quite… there are some great opportunities to hit that level against the SAMR framework in using that app. However, if that teacher just gets students to type up their work in Book Creator then they are only hitting a substitution activity. Couldn’t they actually just be writing this on paper? How is using the app transforming learning here? It’s simply not. I was greatly heartened last week when @AndyBartlettCPD tweeted me the image above. A planning document he’d made for one of the initial meetings of a group of 8 teachers and SLT looking to develop iPad pedagogy in school. Just how it should be with learning and thinking right at the heart of the matter. If you’re thinking about bringing in new technology, whatever it is, I’d love to hear your thoughts on the above and how you’re approaching it. I don’t profess to have everything right and know it all, but this is my best thinking. My utopia in education is a world which recognises that with hundreds of thousands of pounds being spent on such expensive equipment, effective CPD and training is required. Schools and managers must recognise the importance of it all being related to learning, supported by sound CPD that empowers teachers to make the best choices about learning in their classrooms with the kit they’ve got. I look forward to hearing your thoughts. 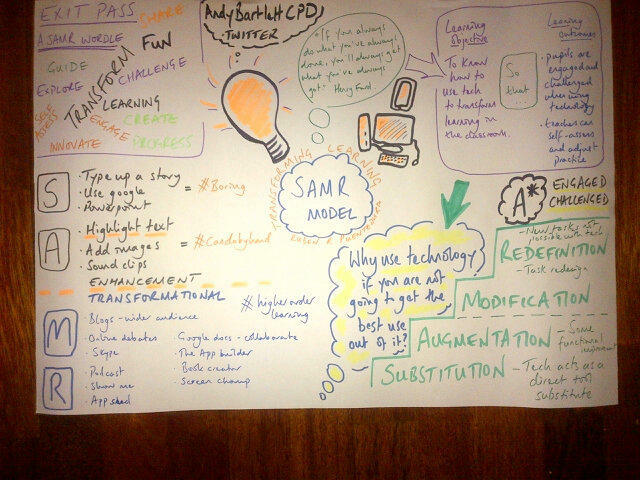 I had the same thoughts as you after seeing the SAMR model apps poster on the appsineducation blog. In fact, at a workshop today, it became clear to me that most of the teachers there understood that the poster was problematic. As you wrote above, just because you are using an app in the R level does not mean you are redefining the task… It is how you use the app that matters. One could use the VoiceThread app at any of the levels in SAMR. Hi Jim. Thanks for commenting. Really appreciate it. I think you’re absolutely bang on the money there. With great power comes… Etc. I agree completely with what you say. I think there’s a real danger of people just not getting it right. You need to know and understand SAMR before you can actually start applying the ideas on the poster. I totally agree with what you said, there is a Chinese saying : “Use facility properly, not enslaved by it. ” just a perfect footnote to it.